Thanks to Ground Rules of Marlins Park—or lack thereof—All-Star Aaron Judge's Home Run Derby nearly ended disastrously after he prematurely celebrated a Round One victory one home run too early, thanks to a batted ball hitting the stadium's ceiling in flight. HR Derby Ground Rules (or lack thereof). Unlike intrastate rival Tampa Bay's Tropicana Field and its intricate series of Ground Rules pertaining to the domed stadium's "Catwalks, Lights and Suspended Objects" overhangs, Marlins Park states that a batted ball striking a ceiling, support beam, or its retractable roof during flight, over fair territory, is a live ball and in play. 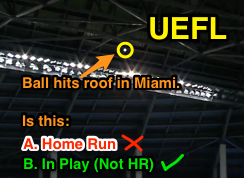 Tidbit: Miami's only Ground Rule prior to 2016 was, "Ball striking facing of roof over dugouts: Out of Play." Let's assume we were in Miami prior to the adoption of the roof ground rule, leaving us to the Universal Ground Rules, which state nothing of a ball striking a ceiling during play. As for the Official Baseball Rules, the point is not specifically addressed, which means that a ball striking the ceiling is subject to Rules 5.05(a)(5) and 8.01(c) ("Each umpire has authority to rule on any point not specifically covered in these rules"). Rule 5.05(a)(5) specifies when the batter becomes a runner: "A fair ball passes over a fence or into the stands at a distance from home base of 250 feet or more. Such hit entitles the batter to a home run when he shall have touched all bases legally. A fair fly ball that passes out of the playing field at a point less than 250 feet from home base shall entitle the batter to advance to second base only." Rule 5.06(b)(4)(A) is similar: "[Runners advance] To home base, scoring a run, if a fair ball goes out of the playing field in flight and he touched all bases legally; or if a fair ball which, in the umpire’s judgment, would have gone out of the playing field in flight, is deflected by the act of a fielder in throwing his glove, cap, or any article of his apparel." Common conception for a ball that hits a ceiling and drops down onto the field of play is that the ball is alive and in play, if for no other reason than the ball never left the field of play and there is no foolproof way to determine what would have happened had the ball not touched the ceiling, beam, or roof. Credit Futures Game Umpires Nate Tomlinson, Eric Bacchus, Jason Starkovich, and Skyler Shown for knowing Miami Park's Ground Rules to address this play, and for applying the Official Baseball Rules to ensure a fair and even playing field for all HR Derby participants.